← Do you know sigfox ? You can see that on the slave, the pin name can be different : SDI is Slave Data In, SDO, Slave Data Out, SCK is Slave ClocK and CS is Chip Select signal. By the way, signals are connected directly together and it’s all what you need for the electrical part. Please note that after having some trouble to read data, I added a 120ohm resistor in series on SDO line. This has solved misreading like getting a 0xFE when 0xFF has been written. Once done, you should have two new devices : /dev/spidev0.0 and /dev/spidev0.1 corresponding to the two SPI channels available on the RPI extended port. As there is no signal to indicate if you want to read or write, what will be done depend only of what master will write. Depending on these data, slave will read or write after it has decoded the master message. The best way is to do both in parallel ! So, what is a Write and Read function ? As we have 2 wires for Input and Output, we can in parallel write data and read data, this is what we are going to do : this function will get a buffer containing the data to be sent on the MOSI line; this function is also listening on MISO line and fill the read bits in the given buffer. You just have to indicates how many byte you want to transmit / listen and the buffer you send is returned with the read bytes. This means that the slave is expecting 8bits on SDI to identify a short address read, the next 8 bits do not care for the slave. But during the time of the next 8 bits, the slave will write the expected data on the SDO line. The Linux driver will get these bits and store them in the given buffer. spi.tx_buf        = (unsigned long)(buff) ;  // transmit from "data"
spi.rx_buf        = (unsigned long)(buff) ;  // receive into "data"
In this example, buff contains the command to be transfered to the Slave ; according to the documentation, we are sending a bit to 0 to indicate a short address order, then 6 bits indicates the address, then we are finishing with a 0 to indicate a read. The buff do not care but we will keep it clean. Once executed, the buff will be cleared as the timing figure indicate SDO is by default low and buff will contain the read value. 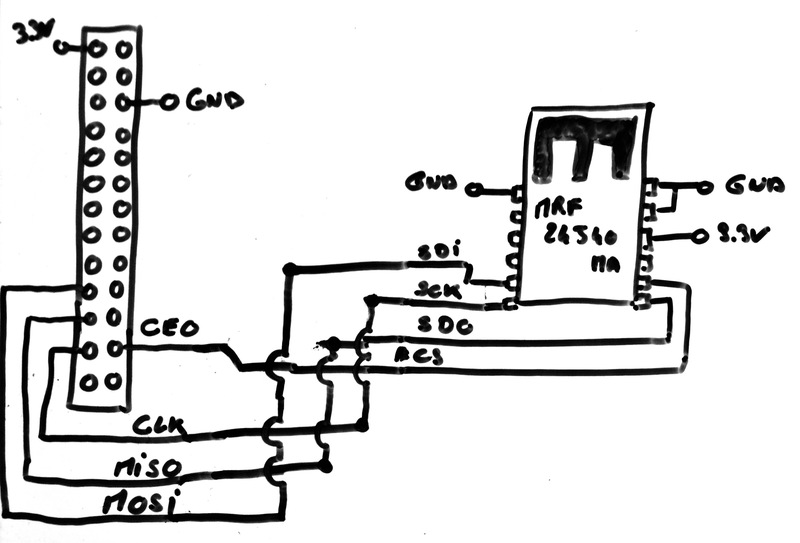 This is all what we need to use SPI, now, as SPI is not a serial communication port like a RS232 but a way interconnected master & slave, you have to implement an upper layer protocol, specific to the slave. For those interested in how to use the MFR24j40MA board with RPI, let’s take a look to my future article, I’ll detail it once implemented ! This entry was posted in Hardware and tagged raspberry pi, spi, zigbee. Bookmark the permalink. Wow! Thank you, thank you, thank you! I was considering using the R-Pi for the SPI control of just that chip/module and have very little time to make it work. If I do this, your help will be invaluable. Actually, I did not finish the code for this chip and i did not found an existing solution on Internet. The best way in my point of view to do it on a RPI is to use the working code existing on arduino and connect an arduino to the raspberry with serial line. That way you can make it work in 1 hour max. However, it was not an embedded solution. It is still a good starting point. I would expect that I will start with only a custom/simple communication stack as I do not know of a simple stack such as Zigbee or 6LoPAN that is ported to the R-Pi … unless you know of such a stack for the R-Pi? Also, do you know a good web site that integrates the MRF24J40 with Arduino? Hello Paul, I wonder if you could provide the fnal version of the code, I am beginner and I’m working on the project with the same specification of his, but I could not make this code execute with success in raspiberry. Hello, in fact I’m jumped on many different projects so I’m far away to finish this post and hack. BUT there are small & easy to port libraries for arduino you can just port on RPI, I assume a couple of hours only is needed for this and it should make the job. Unfortunately I did not save the link to these lib but Google will tell you the way to go. Have fun ! And if you have some peace of code, do not hesitate to be back and push it to my site for sharing.